I literally watched this movie about twenty times when I first got it, VHS , a box-set of the original three. But this one is best! It was the most exciting, it kept you on the edge of your seat and your mind the whole way through. Although, I have to say, Lucas has become very lazy in the Star Wars saga since the Phantom Menace, which was quite poor. This is vintage Lucas and this your vintage space movie. 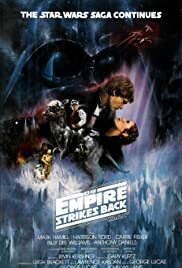 Star Wars (any of the original 3 and Episode 3) is a must see! It includes many household names. Some, though, hate Star Wars with a vengeance. Those people lack in creativity and are subject to boring, lack-luster films. All I can say is have fun because I know you won't for missing out on this 5-star, one of a kind classic. Must see, it's too great for a 10 out of 10 rating. It was way ahead of its time. It's a film of the ages and has caliber modern films dream to re-create!